Over-the-top-delivered content will account for 46% of all Western European TV revenues by 2023, up from 26% in 2017, according to Digital TV Research. The new report claims that OTT revenues for TV episodes and movies – both from ad-supported and subscription services – will more than double from US$10 billion to US$23 billion over the forecast period. Subscription video-on-demand revenues alone are expected to grow from US$4.44 billion in 2017 to US$12.47 billion in 2023 – with Netflix tipped to account for 57% Western Europe’s SVOD revenues by 2023, up from 52% in 2017. The OTT gains will offset an anticipated US$2 billion decline in pay TV revenues between 2017 and 2023. 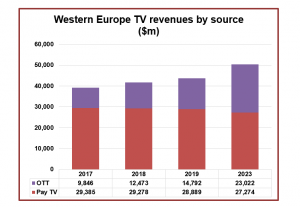 Overall, Western European TV revenues – from OTT and pay TV – are forecast to grow from US$39 billion to US$50 billion. 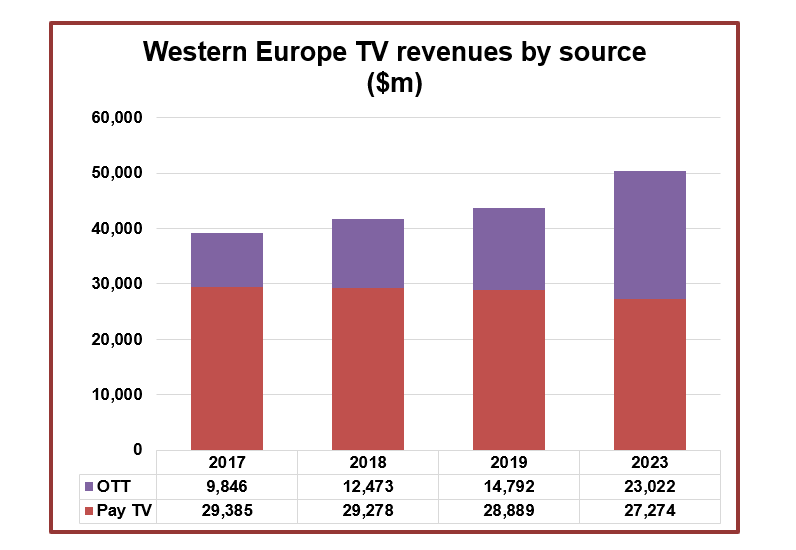 “Western Europe will have 205 million TV subscriptions by 2023, up from 153 million in 2017,” said Simon Murray, principal analyst at Digital TV Research. The SVOD figures refer to gross subscription numbers, with a single household able to have more than one subscription.